Must be my British ancestral blood that makes me go weak at the knees when I witness the beauty of those ancient lands. 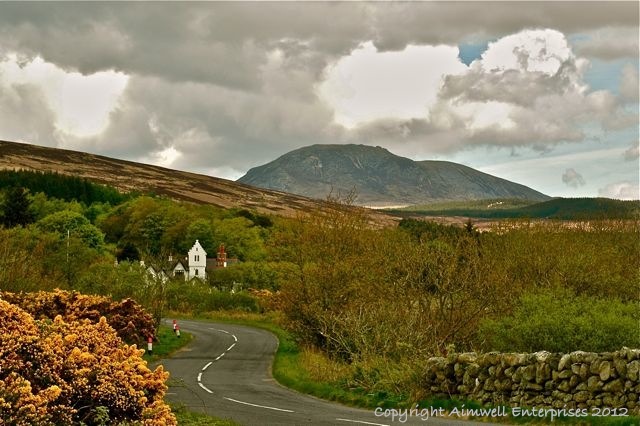 To me this image emotes Scotland … the white-painted stone house surrounded in native shrubs; the golden gorse whose coconut fragrance intoxicates me even with the memory of it; the stone walls and winding road and rolling hills and cloud-cloaked skies. And the buffeting winds that embraced me as I captured this moment and held it in my heart. This entry was posted in Europe, Landscapes, Musings, Nature, Photography, Reflections, Scotland, Travel, Uncategorized and tagged Britain, Isle of Arran, landscape, mountains, Photography, Scotland, spring, Travel. Bookmark the permalink. Yes, I do believe it is part of our heritage to feel this way. I love the sunnier climes, but I’m also at home on the Scottish moors. Absolutely stunning,now I know I must go to Scotland. So beautiful! A perfect picture.